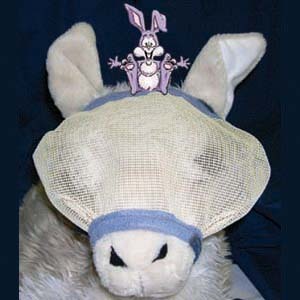 Made of see thru netting with protected edges and hook and loop fasteners, these masks protect the llamas and alpaca eyes and face from pesky flies and gnats. 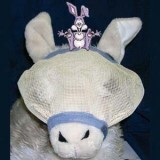 Easy to attach and our llamas do not mind wearing them at all. We recommend removing at night and wash as needed. small for babies & wealings, medium for yearling to average, large for larger adults, XL for super large adults approximate measurements around the nose where a halter would bit: Small 8-10" medium 10-12" large 12-14" XL 14-16"